Everyone’s favorite red, white and blue holiday, July 4th is all about great food and friends, family, fireworks, music and soaking up summer. Here’s your guide to an epic holiday weekend, Austin-style. Treat yourself: Love fried chicken? 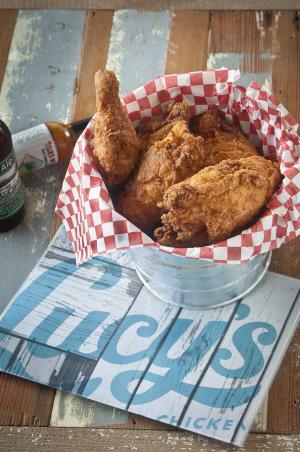 Bring on deep-fried buttermilk heaven at Lucy&apos;s Fried Chicken. Look for the colorful neon lady along South Congress and try twists on classic dishes like Deep Fried Deviled Eggs and Chicks and Chips. Threadgill’s tasty music history runs deep, attracting everyone from country fans to rock-loving hippies (Janis Joplin was a waitress and performer) since the 1930s. Today, Threadgill’s is known for its Southern comfort food (try the signature chicken-fried steak) and live shows. See the show: Join Austin&apos;s largest Independence Day celebration at Auditorium Shores at The Long Center. The Austin Symphony H-E-B July 4th Concert & Fireworks includes patriotic music by the Austin Symphony with a grand finale fireworks display over Lady Bird Lake. Treat yourself: Head west, into the Hill Country, for a truly Texan meal at Jack Allen&apos;s Kitchen, Oak Hill. This farm-to-table eatery serves up a fresh menu each night, featuring locally sourced ingredients and beverages. Treat yourself to one of the specialty margaritas alongside the smashed guacamole. Make tracks to Bee Cave in the Texas Hill Country and get your bib ready for some lip-smacking baby back ribs from Schmidt Family Barbecue. In business for more than 75 years, the Schmidts are known for their house-smoked meats, including tender barbecue beef brisket. See the show: Head to the Hill Country Galleria Independence Day Festival for live music, more than 75 art vendors, festival food and barbecue. Bring the whole family and splash around in the kid’s water zone, get your fill of rides and games, and finish out the evening with a spectacular fireworks show. Treat yourself: Pack up the kids and head to Hat Creek&apos;s Round Rock location, right outside of Old Settler&apos;s Park. This indoor/outdoor burger spot features all natural juicy burgers, milkshakes for the kids, craft beer for the &apos;rents, picnic tables and a playground. Yes, you’re still in Texas. But Louisiana Longhorn Cafe in Round Rock brings the Cajun attitude with family-recipe dishes like shrimp Creole and crawfish etouffee. Pair your meal with a refreshing Hurricane. See the show: Head to Round Rock for the annual July Fourth Frontier Days Celebration & July Fourth Parade for live music, family-friendly games, the annual pig races and festival food and a spectacular fireworks show. Bring the whole family for the festival and parade then finish out the evening with movies after dark. Treat yourself: Take in the Nantucket beach house vibe on Perla&apos;s wooden deck. The South Congress seafood and oyster bar is made for long lunches and happy hours. Savor fresh oysters from Washington to Prince Edward Island and apps like crab cakes and New Orleans-style BBQ shrimp. Want to take your meal with you to watch fireworks? Order a New York-style pie from Home Slice Pizza. The hand-tossed pizzas are a South Congress neighborhood favorite, with toppings ranging from traditional sausage to fried eggplant. See the show: Watch the city’s finest firework displays light up the July sky from the South First Street Bridge. Get there early and leave the chairs at home – this is a popular spot. Other bridge viewing options: Congress Bridge and Pfluger Pedestrian Bridge. 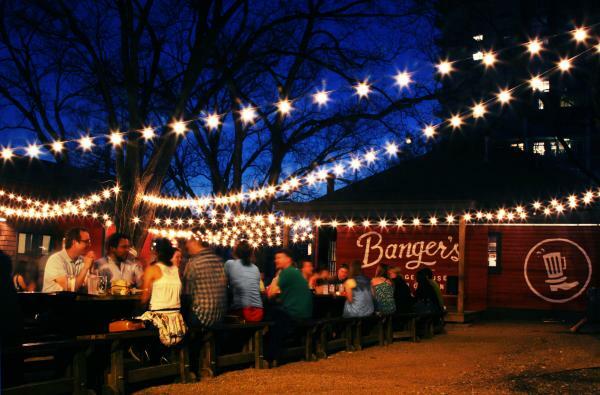 Banger&apos;s Sausage House and Beer Garden. Hut’s Hamburgers – Texas-raised beef, spicy Fats Domino Burger and two for one burgers Wednesdays after 6 p.m.
Craving some of that famous Austin barbecue? Get your taste buds singing with our finger-licking Where the Locals Eat BBQ rundown. Make a long weekend of it and book a stay in an elegant historic hotel or one of Austin’s funky boutiques. Explore all of Austin’s lodging options and book your stay. Photo of Lucy&apos;s Fried Chicken. Courtesy of Bread & Butter PR.